Another fun event in New Smyrna Beach for St. Patrick's Day! 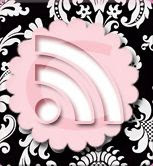 This is one of my favorites and Little Blog Dress is happy to be a sponsor. New Smyrna Beach’s annual St. Patrick’s Day Party called Shamrock and Roll returns Saturday, March 17 to Flagler Avenue. Created for the Irish and Irish at heart, activities begin at noon with multiple Flagler Avenue restaurants and bars offering authentic Irish food and drink specials. A $500 Treasure Hunt runs from 1pm to 9pm with participants collecting items off of a set scavenger list to qualify for a $500 “Pot O Gold” drawing. The Treasure Hunt entry tent will be located on the corner of Flagler Avenue and Cooper Street. The Pub Crawl portion of the party kicks off at 6pm with live entertainment, drink specials and plenty of green beer among the Avenue’s 10 night spots. 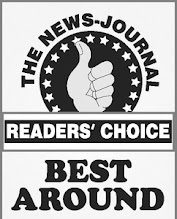 Participating businesses include Atlantis Bistro, Breakers, Café Heavenly, Clancy’s Cantina, Flagler Tavern, Gnarly Surf Bar, Manzano’s Fine Foods, Om Bar and Chill Lounge, Peanuts Restaurant & Sports Bar, That’s Amore, Tayton O’Brians, Toni & Joe’s Patio, and Trader’s Sports Bar among others. Shamrock and Roll is hosted by the Flagler Avenue Hospitality Group and the Flagler Merchants Association, and is sponsored by 1-855-LAW HURT, New Smyrna Chevy, the Waterfront Loop, Little Blog Dress, 1 Hour Printing, and Ducer Photography. Additional sponsors include The Black Crow Event Group, The HOG 95.7 Classic Rock, The VYBE 103.3 Hit Music, KRO Country 93.1 and News Talk 1150. The festival is one of a series held each year on Flagler Avenue including Cino de Mayo, Shrimp and Seafood Festival and Chili & Chaps. Flagler Avenue is located beachside in New Smyrna Beach off the North Causeway Bridge. 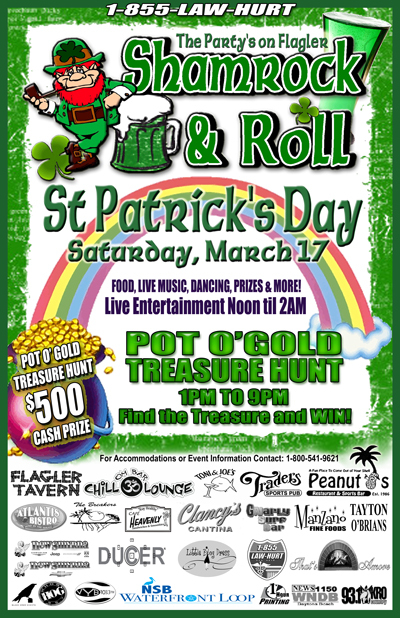 For event information and special Shamrock and Roll on Flagler Festival accommodations, call 1-386-428-1600 or go to partyonflagler.com.